Ongoing to January 26th, Val Britton window installation at SFAC 155 Grove Street: The San Francisco Arts Commission Galleries presents The Continental Interior, a site-specific installation by Val Britton. Drawing on the language of maps, Britton makes imaginary landscapes that depict physical and psychological spaces. 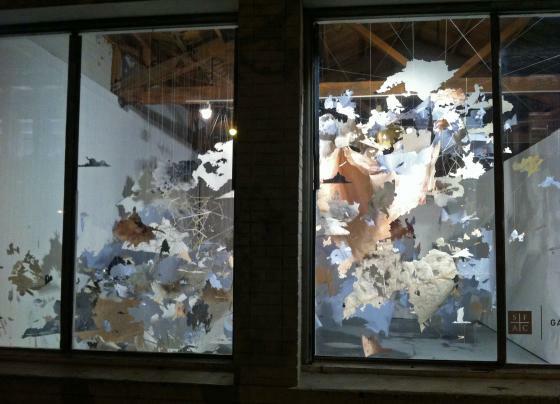 For The Continental Interior, Britton expands the boundaries of her art practice in paper collage, painting, drawing and printmaking by breaking out of the two-dimensional into three-dimensional space, creating a large-scale installation made from hand cut, organic paper shapes that resemble landmasses. This installation is viewable 24/7, so there’s no excuse not to see it. Opening January 18th – February 16th, Taraneh Hemami Resistance at the Luggage Store, 1007 Market Street: Resistance surfaces the underground visual culture of protest, making visible the otherwise absent histories of dissent in Iran and its diaspora through the production of collected and found historical archives, hand-crafted replications of a “social media” before the word existed. Resistance builds on Hemami’s Theory of Survival, collected historical archives from local communities and the web of decades of otherwise banned and censored print matter belonging to the Iranian Students Association of Northern California active from 1964-1984. The material reflects the political sensibilities of the Iranian student organizations worldwide in books, periodicals, newspapers published both inside and outside of Iran. The opening reception is Thursday January 18th from 6-8pm. Also not to miss and still on view is Hemami’s public art installation at Yerba Buena Center for the Arts entitled Free. A neon sign repeats the word “free” in English and Arabic in a circular shape, as in a Sufi prayer, an incantation, a chant, or a declaration. It shines on intricate mirrored vinyl patterns, interacting with the architecture, integrating with the structure, as it alters the identity of the building, while echoing the call for freedom across the globe. January 25th and January 26th, SF Dump Artist in Residence Exhibition Openings, 401 & 503 Tunnel Ave: Michael Damm, Julia Goodman and Jeff Hantman are the current artists in residence at Recology San Francisco. This exhibition is the culmination of four months of work by the artists who have scavenged materials from the dump to make art and promote recycling and reuse. During his residency Michael Damm has created a new video installation for his ongoing series, Incidental Films for an Accidental Audience. 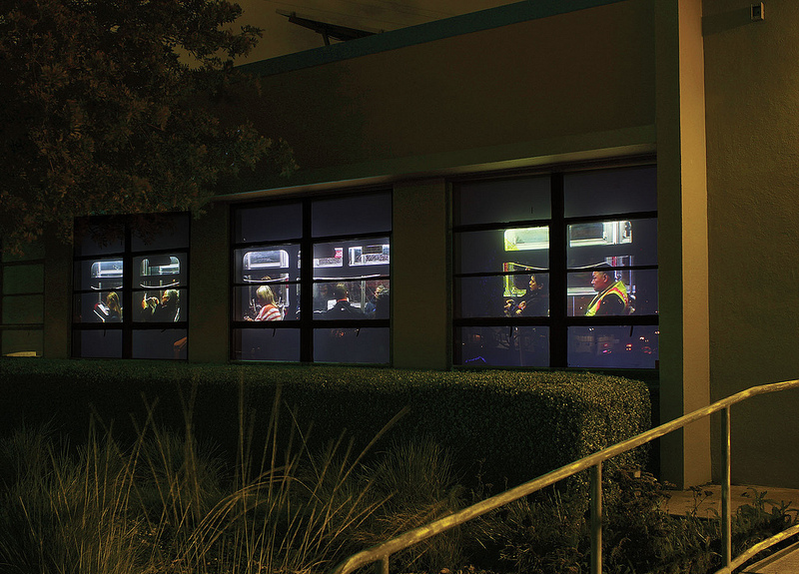 In these projects, Damm uses rear projection to present site-specific videos at night in large windows or doorways along transit corridors. Using the night sky as inspiration, Julia Goodman has created a body of work entitled Rag Sorters and Star Gazers that incorporates the stars as literal and metaphorical guides. A separate body of work is rooted in Goodman’s papermaking practice. These pieces explore the intertwined relationship women have had historically with rag paper, and include the role of San Francisco female laborers in this history. Jeff Hantman combines a range of techniques and materials to create three-dimensional paintings that bow and bulge out from the wall. While at Recology, Hantman has expanded his practice to include free-standing sculptural works. Now viewers can walk around his forms and view the frameworks that underlie his characteristic curved shapes, seeing interiors which are as visually compelling as their exteriors. Reception and viewing hours are: Friday 1/25, 5-9pm reception. Saturday 1/26, 1-3pm reception. Additional viewing hours Tuesday 1/29, 5-7pm along with an artist panel discussion the same night at 7pm at 401 Tunnel Ave.